This conversation on Mermaid tail blankets was sponsored by GearBest. View our complete disclosure policy here. Get in on the awesome mermaid tail blankets and mermaid sleeping bag tread with these awesome products for the whole family, from baby to mom! 5 Adorable Mermaid Tail Blankets for the Entire Family! 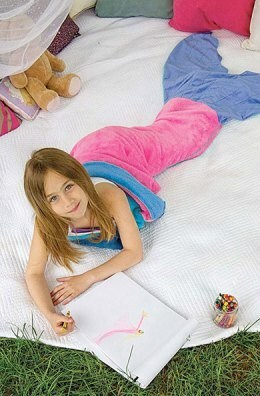 Mermaid tail blankets, also referred to as mermaid sleeping bags, have become the hottest new trend this year. While this may seem a bit strange at first, the more you think about it the more sense it makes. I mean, what better way to get your sleep on than tucked into a warm and cozy wrap-around blanket shaped like mermaid tail? You stay covered all night, even when sharing a bed simply because no one can hog the blankets of pull the covers off of you. You are literally all wrapped up in your own pocket of blankies – just like when you are in a sleeping bag. Plus, it doesn't hurt that mermaid tail blankets are totally adorable. Think of all the cute pictures you could take! Adults love them, kids love them, and they even help make bedtime fun for the little ones! 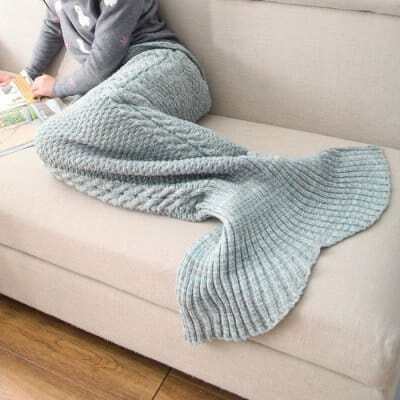 This beautiful Knit Mermaid Tail Blanket is perfect for snuggling up with a good book. This Blue/Grey Mermaid Tail Blanket has a lovely cable knit look to it. The Cute Color Block Mermaid Design Blanket is the perfect size for kids. 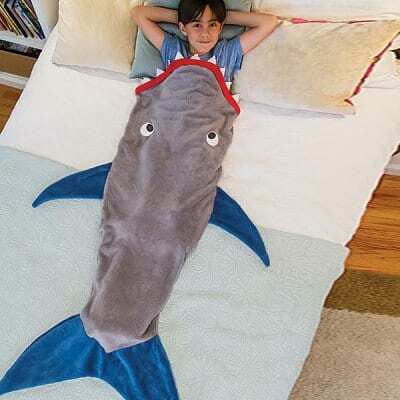 For those kiddies who prefer something more vicious than a mermaid, the Shark Blanket by Blankie Tails is just as warm and cozy! 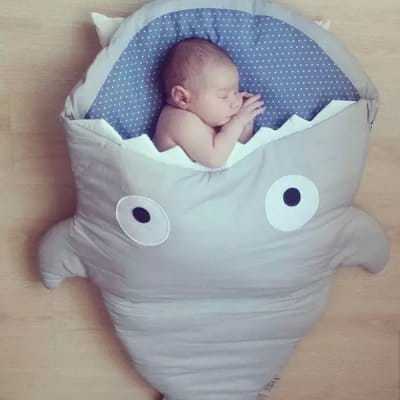 Even babies can jump on board the mermaid tail trend with this adorable Shark Blanket by Blankie Tails. 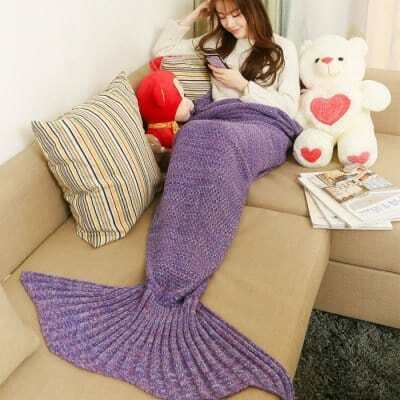 GearBest.com has a large variety of affordable mermaid tail blankets and shark tail blankets in adult, children, and baby sizes. Almost all the items on GearBest.com come with free shipping too, which makes them an even better deal. Be sure to check out their full inventory of mermaid tail blanket designs to find a tail suitable for every member of the family! For real?! I seriously need one of those mermaid blankets!! I love the blue/grey one! Thanks for sharing because I had no idea these even existed. This would be the perfect gift for me because i stay so cold. It looks very comfortable! I love these mermaid blankets! I am going to crochet one for my children when I have one! Thanks for the awesome ideas! I am going to have to make one of these for each of my family. I am always cold, my granddaughter loves to snuggle and my daughter is always in need of something to keep her relaxed. My nephews & nieces would love these. These are all so adorable, perfect for so many ages, and the grownups, too! I’ve never seen or heard of these before!! These are so cool! Disney’s ‘The Little Mermaid’ is one of my family’s all-time favorite movies. This line of blankets will be perfect for the upcoming colder weather and also just for lounging around in the living room. I need to re-learn how to knit! Seriously! These blankets are incredibly cute. The shark blanket takes the cake though! There’s an option for boys and girls!